A Weight Lifted: Healthy Eating or Disordered Eating in Teens? We get a lot of questions from our participants at Green Mountain at Fox Run about how to help their children avoid eating and weight problems. It's a good question. 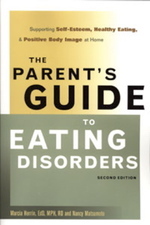 "Since the 1980s, disordered eating has become so common that it affects the majority of adolescent girls," according to Marcia Herrin, EdD, an eating disorders specialist who has updated her book The Parent's Guide to Eating Disorders: Supporting Self-Esteem, Healthy Eating & Positive Body Image at Home. It's affecting boys much more commonly, too. As someone who struggled with disordered eating and eating disorders earlier in my life, I was intent on making sure my two children (girl and boy) didn't follow in my footsteps. I don't think they have, but it's been a challenge even with my professional understanding to help them develop healthy attitudes about food, exercise, their weights, their appearance. Our society is just too distorted about these subjects. I found Marcia's book a good review of how to help our children avoid, or recover from, disordered eating and eating disorders. It's not easy to keep them healthy on this subject...but it's well worth the effort.